Kiev (VNA) – The Embassy of Vietnam in Ukraine hosted a workshop on improving the quality of Vietnamese language education for the Vietnamese community in Ukraine on April 21. The event aimed at finding a practical and effective approach to enhancing Vietnamese language education for the Vietnamese in Ukraine in an attempt to preserve and uphold the national language and unique culture. It drew the participation of a number of local researchers, Vietnamese language lecturers, journalists from local Vietnamese newspapers and students’ parents. Attendees underlined the significance of teaching Vietnamese for overseas Vietnamese, particularly in Ukraine where approximately 10,000 Vietnamese expats are living. They proposed many solutions, including encouraging the community’s engagement in organising Vietnamese language courses, making curriculum, teaching and learning materials, diversifying teaching methods, and raising funds for teachers. 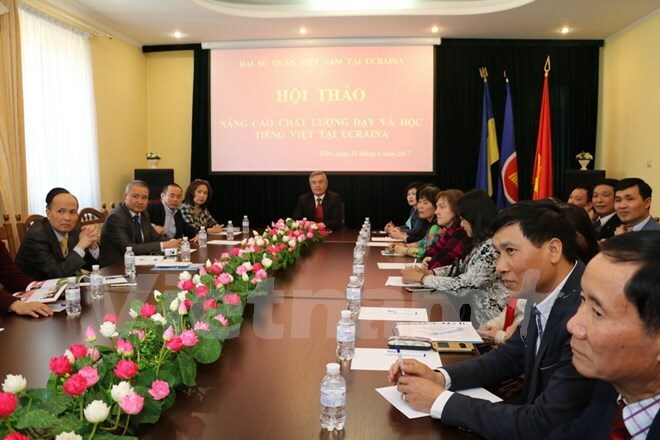 They also outlined several barriers to Vietnamese teaching and learning in Ukraine such as the lack of capable teachers and proper learning materials, and limited funds.